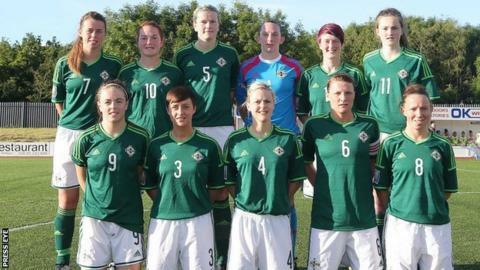 Northern Ireland's women's team suffered a 4-0 defeat away to Poland in their penultimate World Cup 2015 qualifier on Saturday afternoon. Aleksandra Sikora opened the scoring in the 33rd minute, with Ewa ajor netting the first of her two goals after 35. Patrycjca Balcerzak made it 3-0 in the 41st minute abnd Pajor added her second midway through the second half. Northern Ireland have yet to score a goal in the series and lie bottom of their group on two points. Their only two points from their nine matches to date in the qualifying campaign for next year's finals in Canada have come from 0-0 draws. The NI women complete their qualifying schedule with a hone game against the Faroe Islands at Mourneview Park on Wednesday night, 17 September, 19:30 BST.